USB-C5-LC extends one USB device up to 150 feet. 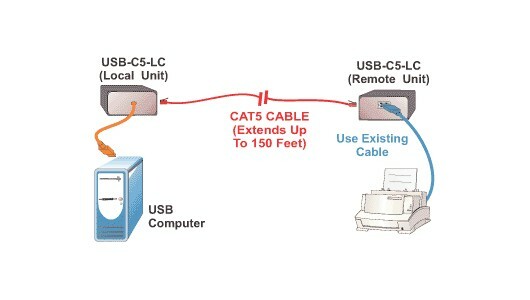 USB-C5-LCPA includes a power supply at the remote unit and extends one USB device up to 150 feet. Compliant with USB 1.1 specifications. Remote unit: powered from USB computer attached to local unit. Remote unit: 110 to 220 VAC at 50 or 60 Hz via AC adapter (Country-specific 5V, 1A AC adapter included). Local unit with 10 inch male USB Type A cable attached.